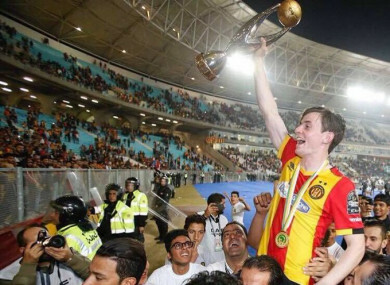 Ben Mohamed holds the African Champions League aloft. AYMAN BEN MOHAMED repeated his Leaving Cert to try and follow his dream of becoming a doctor. Education was always very important in his home growing up, he says. Born in London to an Irish mother and a Tunisian father and raised in Dublin, the 24-year-old’s profile has grown and grown since he left these shores for greater pastures in August 2016 from Bohemians. Last month he won the African Champions League in front of 60,000 spectators and a fortnight ago featured in the illustrious Fifa Club World Cup for Tunisian champions Esperance in a competition boasting stars like Gareth Bale, Luca Modric and Sergio Ramos of Real Madrid. Ex-Bohemians player Ayman Ben Mohamed lined out for Tunisia against Mohamed Salah last night, a long way from Dalymount Park. Last week he won the African Champions League with Esperance. A fine week for the Dublin raised player. It’s been a long journey from his days playing in front of paltry crowds of a few hundred people at UCD and Longford Town. But a worthwhile journey which has seen him successfully follow his dream of becoming a footballer on the world stage. His is an ongoing success story of potential realised, and then fulfilled. He didn’t get the points for medicine at Trinity the second time around, and instead settled for BESS (a degree in business, economics, political science and sociology). It was a good second choice, he says. A course where he could combine his sports scholarship with slowly honing his future career as a professional footballer. He did his lectures in Trinity by day and slowly climbed the ladder in the League of Ireland by night. You see, Ayman Ben Mohamed has always had a carefully prepared plan all along. After half a season tearing it up at Dalymount Park as an immediate fans’ favourite (the Jodi Stand would sing the 1981 Human League hit Don’t You Want Me with a catchy version of ‘Ben Mohamed Babyyyyy’) he received his first ever international call-up for Tunisia and a few short months later was gone; Tunisian champions Esperance snapping him up. Two and a half years on and his plan has worked a charm. He is a Champions League winner, an international for his country, has played on the global stage in the Club World Cup and is still only 24-years-old. “It’s been a mad few months,” he says speaking to The42. “Since winning the Champions League and playing with the international team, it’s been really good. I’ve really enjoyed the last few seasons. “I have an apartment of my own out here, the family come up and down from Ireland. I’m enjoying life at the moment, even though it was difficult at the start to get used to living in Tunisia, everything was kind of different. We are speaking a week before he jets off from Tunisia to the United Arab Emirates to take part in the Club World Cup. Ahead of the competition he says the dream is to take on European champions Real Madrid in the final, but his team suffer a disappointing 3-0 defeat to Abu Dhabi side Al-Ain to end any hope of that dream transitioning into reality. A penalty shoot-out victory against CONCACAF champions Guadalajara secures fifth place, making it a happy note to bow out of the tournament despite the clear anti-climax of falling short in the quarter-finals. We need to go all the way back to the start to track his incredible trajectory. League of Ireland supporters knew for years that Ben Mohamed had the talent and ability to be a success at a bigger club, but the manner in which he has elevated himself from promising Bohemians winger to going toe-to-toe with a player of Salah’s quality is quite remarkable. Speaking with the player about his rise, it is also a testament to his single-minded determination to fulfil his potential and reach the heights he has always known, deep down, that he was capable of. His ability earned Ben Mohamed the aforementioned scholarship to attend Trinity. Medicine was his first choice, and speaking matter-of-fact, he didn’t particularly enjoy the BESS degree, but instead focussed his energy on playing for the university college team and in the League of Ireland for Longford and for later Bohemians. "African teams in general don't do well in the tournament. This year we're going to try to be an exception." “I wouldn’t say I loved the course, to be honest with you,” Ben Mohamed explains. “I loved my experience in Trinity, I enjoyed my time there and played for the football team and really liked that. But the degree itself wasn’t really what I wanted to do, so I was like: ‘you know what, if something comes up in football I’d be happy to put this on hold or leave it altogether’. That’s what I did with the move here to Esperance, I put education on hold and just took the opportunity to come over here and do football full-time. “To be honest with you, business just wasn’t really interesting for me,” he continues. “I wanted to do something more — I repeated my Leaving Cert, I was trying to get medicine but that didn’t work out. So after that, I just wanted to go for a sort of easy course that didn’t have too much work-load or too many hours, so I could put my focus onto football and give that my full attention. “Throughout my career education has been really important for me. My parents always wanted me to keep it up. Whenever I was stressed out I had football there and I think it’s important to have them both. The 24-year-old holds the African Champions League trophy after his side's 3-0 second leg win against Egypt's Al-Ahly on 9 November. His rise in the SSE Airtricity League was rapid, with each club’s supporters only able to enjoy Ben Mohamed’s talents very briefly before he was gone. Onto the next club, a new level to test himself, slowly climbing the ladder, gaining more exposure and following his plan. “I really enjoyed my time in the League of Ireland,” he explains. “It was a really good experience. I started off in UCD and I think that was the ideal club for me at the time. Like I said, I was doing my Leaving Cert and because its a college-based team it has that sort of academic background, so I think that helped. “Then after that it was Longford. I had a good year there, injury-free, and met some really nice people. After that it was Bohemians. The reason I picked Bohs was because a lot of people would follow them and they have more of a spotlight on them… it’s closer to home too. So I felt going to Bohs I could get the exposure that I needed to get a transfer away somewhere. So I’m glad my sort of ‘plan’ worked out,” he laughs. He made his name in the Premier Division as a cagey winger full of pace and running. A player with the confidence to run straight at defenders directly and the skill, quick feet and slight, skinny frame to drift in and out of challenges. Ambitious off the field to keep pushing himself further and further to the next level, the next new challenge, his work-rate was also greatly admired and appreciated, particularly during those final summer months with Bohemians in 2016, where his performances made him stick out like a sore thumb during matches in the best possible way. Simply put, he ran rings around opposition defences. He has since been converted to a left-back, happy to attack and run forward just like he did at grounds all around Ireland, and he has also been deployed in midfield, too. The young player says the League of Ireland is often not appreciated enough, with his story an endorsement that footballers in the domestic league can make it big. “The League of Ireland… I don’t think it gets a lot of credit. It’s not really that well followed unfortunately and it’s not really that well supported on a wider scale, but I do think it produces some great players, the Irish national team has loads of ex-League of Ireland players. He hit the headlines by winning the African Champions League just under a month ago. His side trailed 3-1 from the first leg against Al-Ahly (a game Ben Mohamed missed through injury) but produced a stunning performance in the return leg to win 3-0 at home and secure the title. It was a momentous achievement for the player himself, years of hard work and grit paying off. But it also was a moment of reflection for Irish football supporters, many of whom couldn’t believe such a player had slipped through the cracks and not been capped at underage level by the FAI. Ben Mohamed says he would have been more than happy to play for Ireland, the country he grew up in all his life, but the call never came. Instead, he received his first international call-up by Tunisia in May 2016 — while he was still a Bohemians player. I definitely would’ve loved to play for Ireland,” he says. “I always said that I’d be equally proud to play for Ireland or for Tunisia. Whoever was really interested in having me, I was going to go with them. Unfortunately I never really got a look-in with the Irish team, even at underage. Never got capped or anything like that. “So I think once Tunisia showed their interest I never really had a second thought, to be honest with you. I was happy to take that chance. They don’t really seem to rate League of Ireland players much with the Irish national team, unfortunately. “I know Graham Burke from Shamrock Rovers got the call last season, but that was the first time in a long time. I think it’s unfortunate and it’s their own mistake, it’s their own loss. So hopefully they’ll learn from their mistakes and give some good League of Ireland prospects a look-in. Ben Mohamed speaks in a calm and assured manner, but does not come across in any way braggadocios about his rise or his success. The player appreciates his roots and is aware of how far he has come from his days lighting up Dalymount Park, often the only source of intrigue or excitement on an otherwise gloomy wet Friday night under the spotlights. A player worth the entrance fee alone, as the old saying might go, and a throwback to wingers belonging to days gone by like Stanley Matthews, or even players of ilk and quality closer to home capable of beating their man, like Johnny Giles or Liam Brady, who also graced the Dalymount surface once upon a time. But despite it all, Ben Mohamed has remained remarkably grounded. Many players allow success to cloud their best judgement, but the former Bohs man has retained the same sense of humbleness and quiet determination which made him such a popular figure amongst all corners of the League of Ireland not so long ago. He says that leaving Ireland was a big decision, but one he knew he had to make in order to fulfil his desire to play on the biggest stages. Coming from 3-1 down in the first leg of the African Champions League final to win the title in front of 60,000 spectators, he says, was one of the greatest nights in his young professional career to date. It was a massive night in my career, the biggest night in my career so far. Personally I think coming back from injury and having struggled here in Tunisia at the start, it made it that little bit extra special for me. “It was a huge occasion for everyone and for me personally, for the club itself too — it’s only the third time in our history that we have won the Champions League. It has been the main objective of Esperance for the last few years to win it and the fact that it’s coming up to the club’s 100-year anniversary as well, it was just perfect timing. “It was a really momentous comeback. Unfortunately I missed the first game through injury, I had a bit of a hamstring strain. They weren’t going to risk me for that game so that I would be ready for the second leg in Tunis (the capital city of Tunisia). “Watching the first game in Egypt… it was quite shameful. There were two penalties given to Al-Ahly that were clearly not penalties. They were using VAR as well for the final, but the referee was pretty dodgy. We felt that we were fairly harshly done by, so I think that gave us a bit of motivation and in the end it worked out in our favour. We came back to Tunisia and we were all motivated, we were all looking to get revenge. Then in the second leg itself, it just went perfectly. It couldn’t have worked out any better. We are speaking a week before he leaves to take part in the Fifa Club World Cup and you can sense the excitement in his voice when he speaks about the prospect of taking part in the competition. Often dismissed as unimportant by English and European clubs this time of year, for clubs coming from North and South America, Asia, Oceania and Africa it is held in much higher regard. I think every footballer dreams of playing in these competitions,” Ben Mohamed says. “I’m really excited. It’s going to be massive for me and for the club and I’m hoping we can hopefully give a good presentation of ourselves. For the country as a whole and for the continent of Africa. Ben Mohamed’s side eventually succumb to that disappointing 3-0 defeat to hosts Al Ain FC in the second round. But getting the chance to show a wider, global audience what he is capable of when the eyes of the world are watching will have been a worthwhile exercise if he is to push on to even greater heights further down the track. You do keep forgetting he only turned 24-years-old three weeks ago. Looking to the future, the player says he has no plans to stop and rest on his laurels. It’s just not in his nature and for a young man who went to the effort of repeating his Leaving Cert a second time around to try and follow one life’s dream. The well of ambition is far from dried up as far as becoming the best footballer he can is concerned. All going according to plan he will be there with Tunisia at next year’s African Cup of Nations, which the country has already qualified for, and beyond that the prospect of walking out at the World Cup in 2022 is a very real one. Tunisia are there every other competition, qualifying in 1998, 2002, 2006 and most recently in 2018 in Russia where they finished third in Group G behind England and Belgium. Nobody would say playing at a World Cup is beyond him, especially given his recent task of having to mark a player of Mohamed Salah’s quality. Pitted against one another during an African Cup of Nations qualifier on 16 November, Ben Mohamed succeeded in keeping the mercurial Liverpool forward quiet… right until he scored a 92nd minute winner to break Tunisian hearts during a 3-2 win for Egypt. I’m actually a Liverpool fan myself,” he smiles. “I’m a big fan of Mo Salah, so it was a really interesting experience to mark him; man-mark him as well. He’s a top quality player and I’ve huge admiration for what he has done. “Unfortunately he did get the goal that beat us on the night, but I still have huge respect for him and it was a really great opportunity for me to be able to mark him. He’s a really intelligent player. His movement and his awareness and his speed is incredible. He’s a difficult player to keep quiet, but I felt I did well against him. “I felt I had him for most of the game and did well considering his level and everything like that. So I was happy with my performance. He did score the winner in the end, but I guess that’s what makes him world-class. I spoke to him a little bit on the pitch, just briefly because I was concentrating on the game and didn’t want to get distracted. After the game I wanted to speak to him a little more. “Maybe next time,” Ben Mohamed smiles. Email “'It's been a mad few months': From Trinity and Dalymount to marking Mo Salah and gracing the Fifa Club World Cup”. Feedback on “'It's been a mad few months': From Trinity and Dalymount to marking Mo Salah and gracing the Fifa Club World Cup”.